Orangeries - Flint and Dean Ltd. In the 17th to the 19th centuries orangeries were symbols of prestige and wealth. Fine structures with a distinguished classical architectural form that stood in the grounds of fashionable and period residences that would have been used for over wintering citrus trees. A key signature of an orangery is the bold colonnade affect and an orangery without this element is simply a glazed structure without architectural merit or identity. An orangery will generally have wide classical pilasters flanking each window or door-set and these are often mirrored internally. 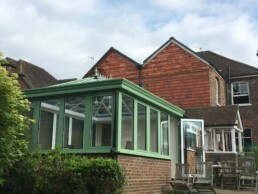 Orangeries give a shallow roof pitch giving the effect of a diminished roof and creating a roof profile that is less imposing and more suitable to certain architectural styles. At Flint + Dean we work towards keeping all the original architectural design external, yet bring the inside into the 21st century.